Hei, viikko naiskortteja, vuorossa pikkunäpertelyä paperikukkain kera. Kukat ja palat leikattu Heartfelt Creations paperista, kohotettu 3d tarroilla, käsitelty Crystal Glazella ja Liquid Pearlsillä. Paperin reunat ressattu ja ommeltu. Ei tekstiä, sopii moniin onnitteluihin. Hi, another fabulous woman with Rubber Romance stamp (Fiona), coloured with ProMarkers. Papers are Heartfelt Creations, I cut some little flowers and items and added Crystal Glaze on them - and raised them up with foam. 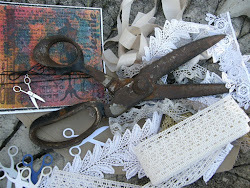 Paper edges are distressed and stitched. Sorry about the poor picture, I think this is really beautiful card for a adult woman or a mother. 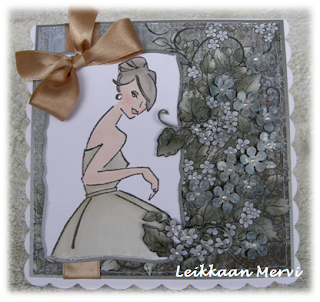 SP die cuts; flowers with Fiskars punch. Your right it is a beautiful card, love the grey colors and the flowers are so pretty,and the lovely ribbon and bow, beautiful card thanks for sharing and have great day..
A beautiful card. Love the image and colours. Thanks for sharing with us at Penny's and good luck. 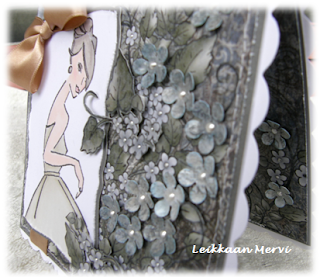 This is such a stunning and elegant card, Marvi! So many pretty flowers! Thanks for joining us at Cuttin' and Stampin'!